Brief Synopsis: Brainiac executes his master plan, turning Lex Luthor against his teammates. 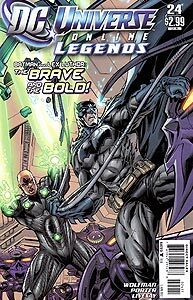 Issue Notes: This series serves as the out-of-continuity back-story for the DC Universe as found in the DC Universe Online video game. Following the battle against Brainaic's forces in the previous issue, Booster Gold lies among the wounded heroes in the makeshift medical ward in the Batcave.